When I opened up the game's manual to find an introduction that criticises a certain recent romantic vampire fiction series (Twilight, in case I needed to be obvious) and claims that the developers wanted to bring vampires back to being what they used to be, I had a smile on my face and along with it, high expectations. Does Dark deliver what it so boldly set out to do and make vampires the dark masters of the night they once were? You are Eric, a man who finds himself in a seedy nightclub, not knowing how he got there. Confused about his amnesia, he talks to some of the people at the club and finds out the truth - everyone there, including himself is a vampire. As he has only just been turned, he is taught by the club's owner how to use his powers and that he needs the blood of whoever turned him in order to become a full vampire. He is sent on a serious of quests to find out what happened to him and finds himself uncovering a conspiracy. And what's wrong with collecting souvenirs? Quite honestly, I don't believe Dark lived up to their introduction and many of the characters, including Eric himself, hardly seem like they could ever match up to Count Dracula. The game's setting and the personalities of each vampire feel like they could be at home in an TV series aimed at teenagers who are actually fans of Twilight, rather than the apparent aim to go against it. 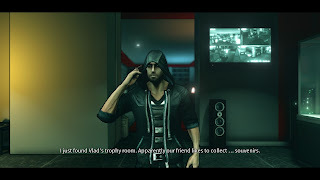 Dark is a stealth-action game with RPG elements. Being a fan of stealth games, I'm pretty familiar with the mechanics and how things work, so at the same time I'm also very picky about what works and what doesn't. Having to sneak up on every enemy and simply pressing the square button to kill them feels very underwhelming, especially when the game claims on the back of the case you can use 'powerful vampire powers and melee attacks'. The melee attacks, as far as I'm concerned, is a huge exaggeration. You sneak up to enemies and are prompted on screen to press one button, similar to a Quick Time Event. 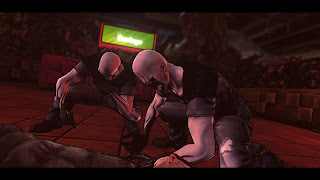 When spotted by enemies you cannot participate in a brutal fight, tearing the mortal apart quickly before anyone else notices, instead you have a few seconds to get close enough to tap square, or else take a few bullets and start over from the last autosave. There is no fighting in Dark, at least not in any beat-em-up style as the blurb on the back of the case implies. Stealth games should always have the opportunity to be able to quickly fight your way out of a ruckus if you get spotted, not find yourself having to restart sections over and over. I don't feel like a dangerous vampiric menace at all when even a lone guard can blow my head off while I have to slowly walk up to him to be able to do anything. The RPG elements whittle down to having conversations with NPCs and skill upgrades, paid for with experience points from killing enemies and completing a level without being discovered. These skills expand on the abilities you can use to help you sneak around and range from being able to kill enemies completely silently to being able to distract enemies from afar. I still don't feel like a powerful vampire though. The Mass Effect-style conversations you can have with NPCs feel pointless unless you're really interested in the game's back-story. There's no EXP or secrets to gain by following certain conversation paths and I feel the game would have benefited without it. The controls are also extremely complicated, having to use a whole combination of the R1, R2, L1 and L2 buttons just to sneak around, teleport to nearby areas and drag bodies around. I remember how fun it was to drag around bodies in Metal Gear Solid and then hide them in lockers; however with Dark it feels more like a chore. The graphics are quite honestly the best thing about the game. 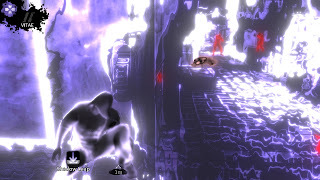 Similar to Borderlands, the cel-shaded visuals are pretty and make the special effects when using vampire abilities look quite unique. However, these graphics are let down by the fact the developers intended Dark to be literally that - gloomy. I know it fits the theme and the style, but I think it would have looked a lot better if it was either vibrantly cel-shaded or cel-shaded at all. The environments can be quite detailed even if there isn't much you can explore due to having to be so cautious because of the extremely strict nature of being spotted so much. The game also tends to bug out sometimes during in-game cutscenes and things don't really look right. For example, people walking up stairs tend to drag themselves up as if they're actually walking on a flat piece of ground. A bit more attention to detail in these sections would have been nice. The music isn't bad, but isn't memorable either. The voice acting feels amateur at best and very low-budget. Dark is a game that I wouldn't exactly say could be played for fun. Sneaking around don’t feel so rewarding and the vampiric abilities feel so underpowered it just makes me want to go back to Castlevania: Symphony of the Night and play as Alucard, a true beast of a vampiric lord. Eric pales in comparison and Dark makes you sneak around not because you are stealthy, but because you are weak.